Nagashino Dam (長篠ダム) is one of three beautiful enclosing bunds in Japan. 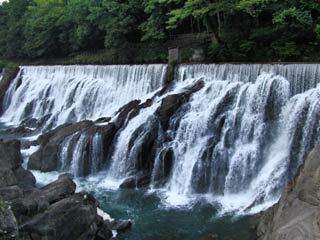 It makes beautiful artificial waterfalls which called Niagara Falls of Shinshiro. The fall is 8m tall. It is also known as Hananoki Dam. There is parking at the restaurants and fishing ponds. There is a fishing pond and restaurant which you can enjoy watching the waterfalls.